United States manager Jurgen Klinsmann has criticised Fifa's appointment of an Algerian referee for their World Cup second-round match against Belgium. Djamel Haimoudi, 44, will take charge of the tie in Salvador on Tuesday. 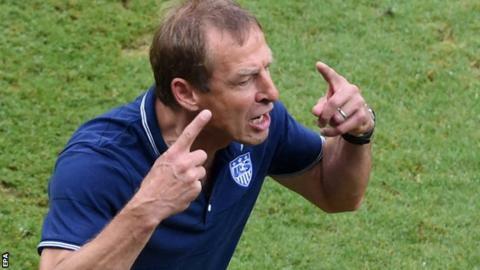 Klinsmann maintains the Belgians will be able to communicate better with the referee as they both speak French and pointed out that the USA knocked Algeria out of the 2010 World Cup. "Is it a good theory? No," he said. "We hope it's not a concern." He added: "I understand it's difficult for Fifa to choose the right referees for the right games and it has always been tricky for Fifa, but it is what it is. "We give it the benefit of the doubt, we respect the decision and hope that everything goes well. "We know that already he did two games very well so we hope he continues that tomorrow." The United States scraped through a tough group containing Germany, Portugal and Ghana to make it through to the last 16. Belgium topped their group with wins over Algeria, Russia and South Korea but Klinsmann remains confident his side can pull off an upset. "We are very hungry and focused," said the former Tottenham striker. "We have a lot of respect for Belgium, but we have no fear at all. We want to go far. "I am confident that if every player plays to his limits we will have a positive outcome."